Petro Poroshenko has claimed outright victory in Ukraine’s presidential election. Billionaire Petro Poroshenko, known as the “chocolate king”, won more than 55% of the vote in the first round, exit polls suggest. Announcing he had won, the 48-year-old businessman promised to forge closer links with the EU and restore peace in restive eastern regions. Pro-Russian separatists severely disrupted voting there. Some 20 people have died in fighting in recent days. No polling stations were open in Donetsk city, and across the region only seven out of 12 district electoral commissions were operating. The separatists are in control of large areas of the Donestk and Luhansk regions. Four hours before polls closed, at 16:00, unofficial estimates put the turnout nationwide at 45%. 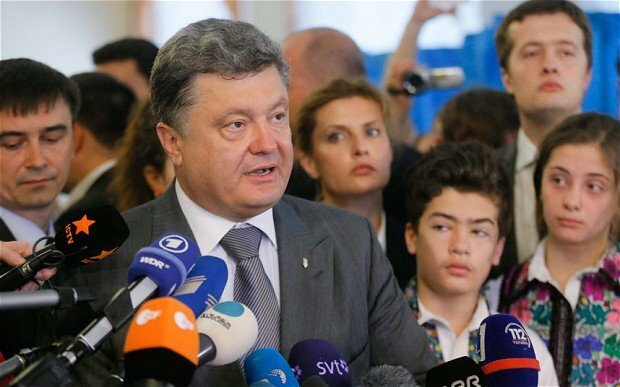 Addressing supporters in Kiev, Petro Poroshenko said he would support a parliamentary election later this year. He also said he would never recognize Russia’s “occupation of Crimea”, annexed by Moscow in March. Asked about relations with Russia, he said the “sovereignty and territorial integrity” of Ukraine mattered most to him. Petro Poroshenko is the billionaire owner of the Roshen chocolates group, a TV station and several manufacturing plants. President Barack Obama hailed the election as an “important step forward in the efforts of the Ukrainian government to unify the country”. Sunday’s poll was called after President Viktor Yanukovych was deposed in February, amid mass protests against his pro-Russian policies. Local elections were also held on Sunday in Ukraine. Former boxer Vitaliy Klitschko – again quoting exit polls – claimed he had been elected mayor of Kiev. Vitaliy Klitschko, a pro-Western politician, withdrew his own presidential bid and announced his support for Petro Poroshenko. On Friday Russian President Vladimir Putin said he would respect the outcome of Ukraine’s election. Kiev and the West accuse Russia of stoking separatist sentiment – a claim Vladimir Putin denies. Separatists in Donetsk and Luhansk declared independence after referendums on May 11, a move not recognized by Kiev or its Western allies. The two regions took their cue from a disputed referendum in Crimea, which led to Russia’s annexation of the southern peninsula. Eighteen candidates were competing in the presidential election, seen as a crucial to unite the country. The exit polls suggest ex-PM Yulia Tymoshenko came a distant second, with over 12% of the vote.